Rahim Yar Khan is the last district of Punjab province and is located at the junction of three provinces of Pakistan i.e. Sindh, P unjab and Balochistan. Rahim Yar Khan is named after one of the grandsons of Nawab of Bahawalpur. It is one of the top districts of Pakistan in agriculture production and revenue generation. It is linked by air to the other parts of the country and is situated on the main railway line and National Highway linking Karachi, Lahore and Peshawar & CPEC Motorway. 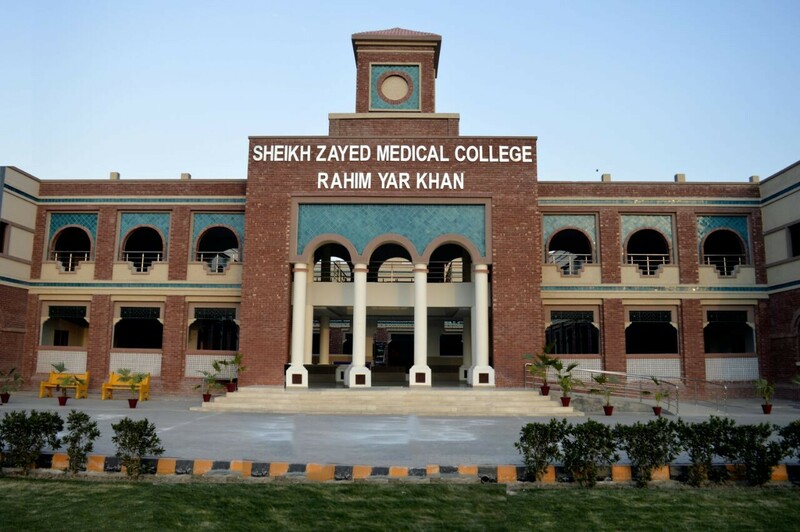 The Sheikh Zayed Medical College Rahim Yar khan was established in March 2003 as a self-financing medical institute. In 2008, Government of Punjab abolished self-finance seats in medical and dental institutions of the Punjab and converted all these seats into open merit seats. Prof. Dr. Eice Muhammad was its first Principal while Prof. Dr. Mubarak Ali is its present Principal. The SZMC/H is a tertiary healthcare institution striving hard towards excellence in teaching and training of Health Professionals and has become a role model of medical education and patient care. With the completion of new college building in 2017, the basic sciences departments and administration of the college has been shifted to this new Campus which is located in the east of Sheikh Zayed Hospital. Rahim Yar Khan is one of the modern district headquarter cities in Punjab. Although the city seems a far off place to those living in Lahore, Rawalpindi or Islamabad but this city has also very good civic facilities. It is connected with rest of Pakistan by air, rail, road and all types of telecommunication links are available. The city has good educational facilities in public and private sector and Sheikh Zayed Medical College is the latest addition to these. Sheikh Zayed Hospital is a medical institution dedicated to providing quality patient care with unrelenting attention to clinical excellence, patient safety and an unparalleled passion and commitment to ensure the very best healthcare for those we serve. SZH got almost all the specialties in the medical field. In this part of the world, providing medical treatment services to all humanity regardless race, cast, nationality and status. Sheikh Zayed Hospital is an Institute designed to treat patients in a way so that they don’t feel any problem in getting expert care. This hospital has high standard of undergraduate and postgraduate facilities. Its 25 disciplines of Medical Sciences are fully accredited with College of Physicians and Surgeons Pakistan for full FCPS Part-II training. The post graduate courses like MD/MS of the University of Health Sciences Lahore has also been started in this hospital. Grooming and educating of the healthcare professionals, inculcating in them all the skills, to provide healthcare with dignity, kindness & respect / honour maintaining highest international standards and stimulating innovation through research. • To seek advances in health sciences to cure and relieve the symptoms of illness, maintain health and foster social prosperity in a thriving environment resulting in protection and promotion of health and prevention of illnesses. • To respond effectively to the ever changing needs of the society through its research programs, educational facilities and curricula. • Teaching to the highest international standards and preparing itself to responsibly address the key challenges faced by the society in the coming decades. • To respect the values and goals of human society by embracing principles of justice, equality of all human beings, internationalism and by acknowledging and fostering individual achievements. The longevity and success of a nation depends upon its individuals and their achievements. The SZMC has achieved enviable results in educational, co-curricular and sports activities. We should keep our fingers crossed that by efforts of all, it will be possible to provide the young generation with the education which will build their character & infuse in them the spirit of humanity and awareness of moral and ethical values. I sincerely hope that our readers will find many interesting and thought provoking articles in this issue written by the future readers. In the end, I congratulate to our students and the whole team of Editorial Board of “Raigzaar 2017” especially Chairman Editorial board Professor Dr. Muhammad Saleem Laghari, Assistant Chairman Dr. Hafiz Umer, Chief editors and Editors for their hard work and dedication which made the timely publication of Raigzaar 2017. I wish you all the success and happiness in the times to come. May Allah Almighty be our Guide in all deeds (Ameen).